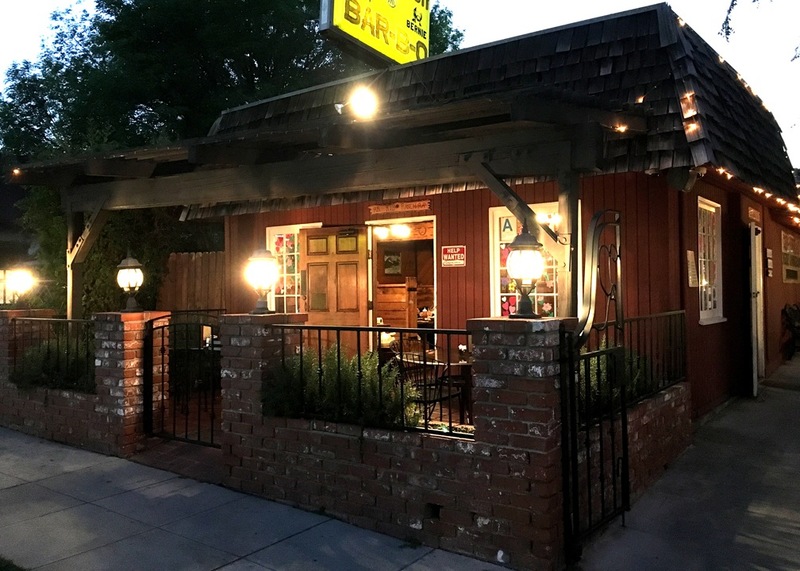 (1973) Rib Ranch BBQ, Woodland Hills | Remains of L.A.
-There were two lovely patios, all bricks and trees, but it was a tiny bit chilly so we opted to sit in the small indoor seating area. 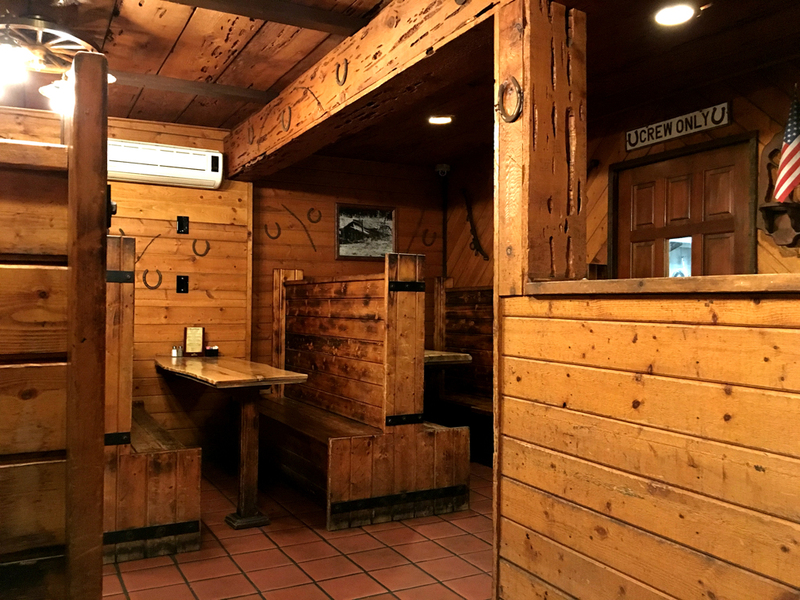 It felt like being inside a stable in the best imaginable way; walls and ceiling of rough-wood planks, large wooden booths with–confusingly–formica wood-look tables, windows painted with a tangle of flowers and hearts in a way that was extremely pleasant while still being slightly reminiscent of the windows in a kindergarten classroom, lots of old riding tackle and ranch equipment on the walls, and many many horseshoes.There is another, larger seating area in the back past the side patio, which I didn’t find until looking for the bathrooms, although I should have spotted the enormous “cozy fireplace inside dining room” sign that hung outside and had an arrow pointing away from where we were. It did look cozy, even though the fire wasn’t lit. -When the waitress brought the menus she also brought a basket of corn muffins which was fantastic, except there were five muffins and three of us, and that led to some passive aggression later. I had a dreadful time choosing between bbq chicken and beef ribs, so the waitress suggested I try the combo, and I did because I figured I could take the leftovers home to David (my husband) only then there weren’t any leftovers. The combo came with sides and I wish it had been a lot more clear that some of the sides were “deluxe sides” that cost extra–I got corn on the cob and mashed potatoes and was startled when the bill came. The menu did say that deluxe sides were $1.25 more, but not in very big letters. -On the back of the menu there is a lovely story about how the current owners, a husband and wife, first met and fell in love when they were teenagers, and he worked as a cook at the Rib Ranch and she worked as a waitress. Now, today, their children work here too. I am a ridiculous sucker for stories like that. -Not that many people eating in, but lots of people coming and going with take-out. There’s something delightful to me about take-out, much more than having food delivered. I think it’s childhood memories of driving home from a restaurant with my dad, the smell of the food filling the car, knowing that soon we would be eating it and watching TV. Just the concept of people getting food to go makes me oddly happy. -The larger dining room in the back has big TVs on the wall. They feel very out of place–too modern and not at all ranch-y. I was glad the room I was eating in didn’t have them. 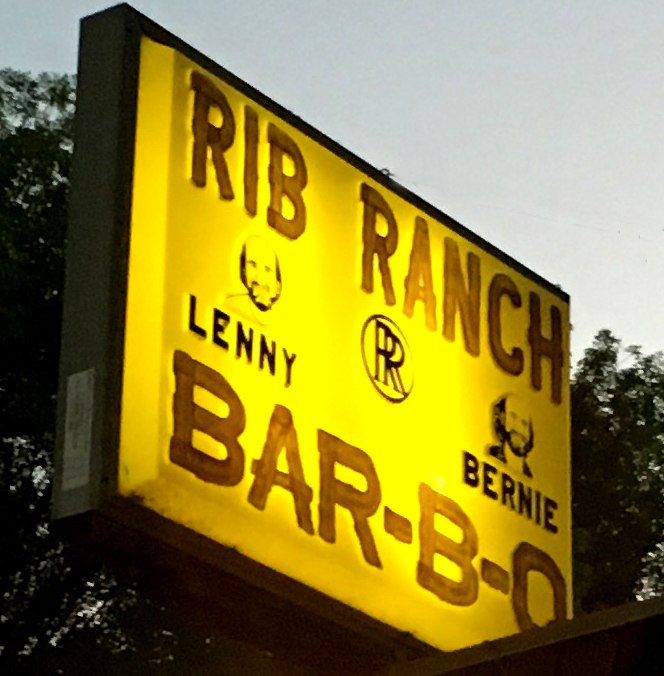 -The sign outside, that says “Rib Ranch Bar-B-Q,” also has drawings of two men, labeled “Lenny” and “Bernie.” They were the brothers who originally owned the Rib Ranch. They were identical twins, which probably made it easier for the person who made the sign. -The water came in tall cups with coke logos, the kind that usually have lids and straws, but there were no lids. I spent the whole time worried I was going to spill, even though I don’t worry about that much when I have a regular glass without a lid. It was just that the lack of lid where one is used to a lid made it seem precariously lid-less. -The woman who painted the flowers and hearts on the window next to our booth was still there, painting one of the other windows. I like to think that that’s her whole job, going around painting the windows of restaurants. I don’t paint, but that seems like it would be a great job. -For some reason we started talking about bed bugs and, when it became clear that I don’t like talking about bed bugs, Ari and Corey started deliberately talking about other types of bugs instead. They believe themselves to be hilarious. 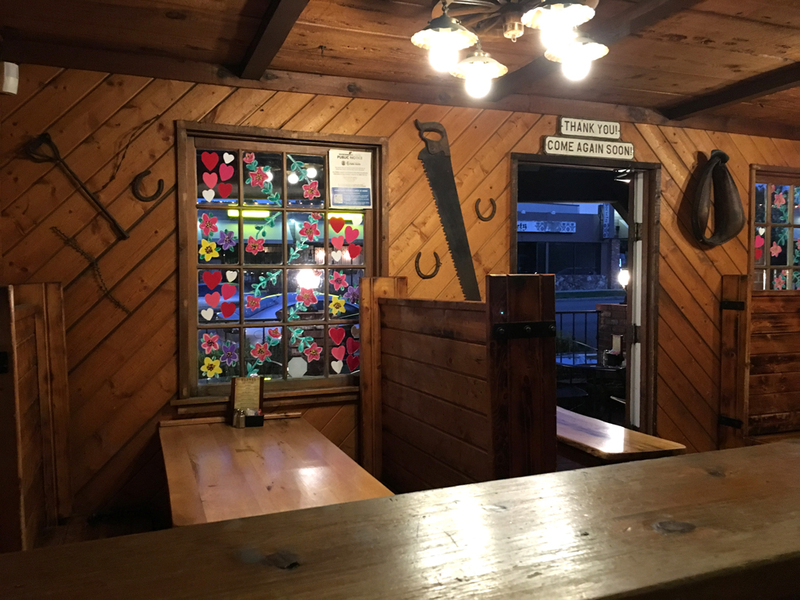 -Looking at all the horseshoes on the walls made me think that probably the first superstition I ever learned was the one about how horseshoes should be hung pointing up so the luck doesn’t drain out. There was a horseshoe hanging on my bedroom wall when I was a very small child. I have a terrible feeling I once clonked my sister over the head with it. -Across the street was a place called “Quilt Emporium” but the font on the sign was hard to read. Corey had thought at first that it was a book store named “Quiet Emporium,” which would be a great name for a bookstore. I had initially read it as “Guilt Emporium,” which we agreed would have to be a gift shop with gifts guaranteed to be a bit nicer than whatever the recipient got you. -Hanging on the wall was an old bottle of BBQ sauce inside a glassed-in display case. There was no label explaining it; I decided that it was probably the first bottle of BBQ sauce they ever sold, but then realized that would have to mean they took it back from whomever the sold it to, in order to frame. -They seemed to be closing up as we left, even though it was a half an hour before the posted closing time. A guy came from the kitchen with his arms full of chains, which was startling until we saw him chaining up chairs on the patio. 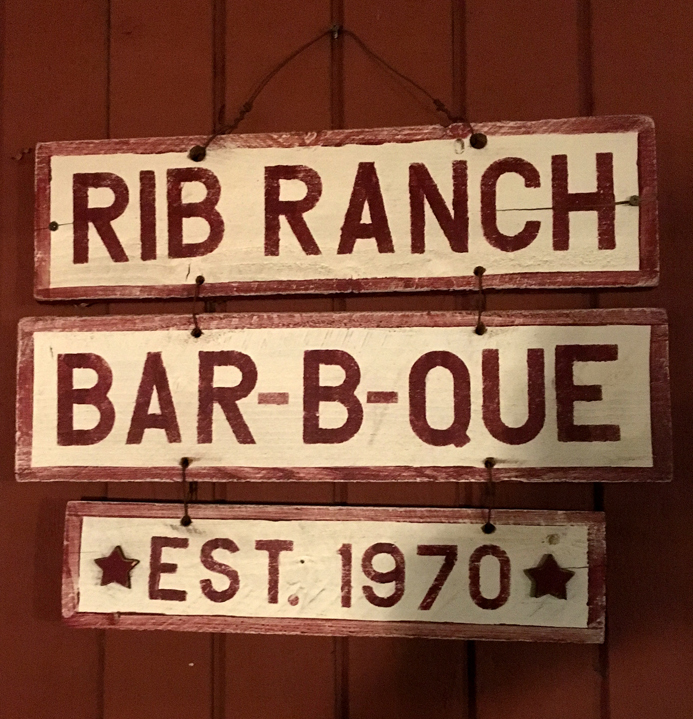 What I Ate: Barbecue chicken, barbecue beef ribs, a corn muffin, corn on the cob, mashed potatoes. 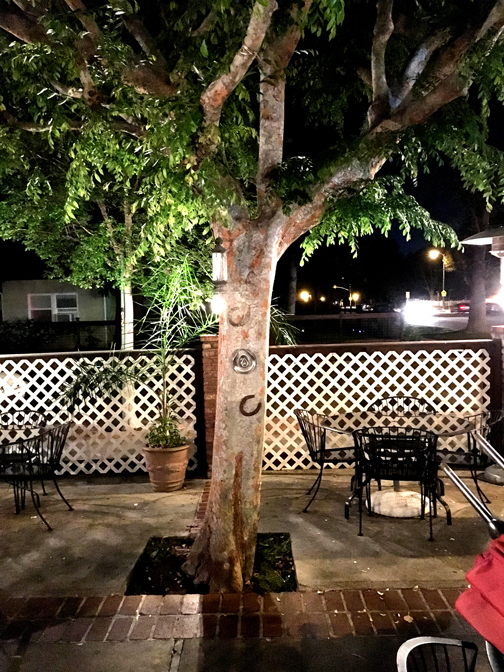 Who I Ate With/Things We Talked About: Ari and Corey; Fast & Loose at Sacred Fools Theatre, the differences in the way the Jewish and Christian faiths envision the afterlife, the book “Baxter, the Pig Who Wanted to Be Kosher” by Laurel Snyder, bugs. 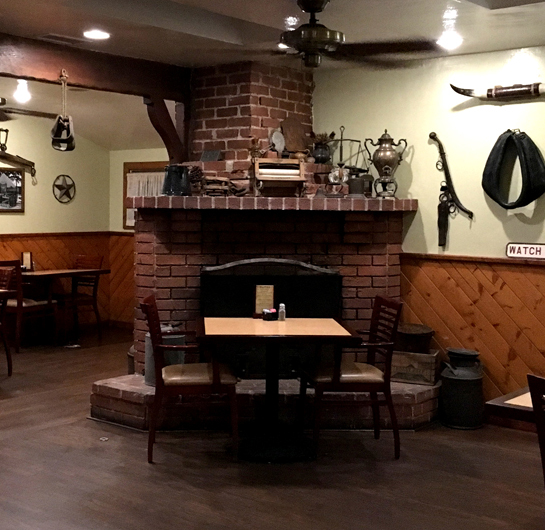 What Sort of Ghost I’d Expect to Find if I Believed in Ghosts Which I do Not: A group of old guys who were around horses all their lives, and didn’t feel comfortable in a lot of restaurants, but loved to come here and eat and tell stories. Adorable! Love it. Hope to go!